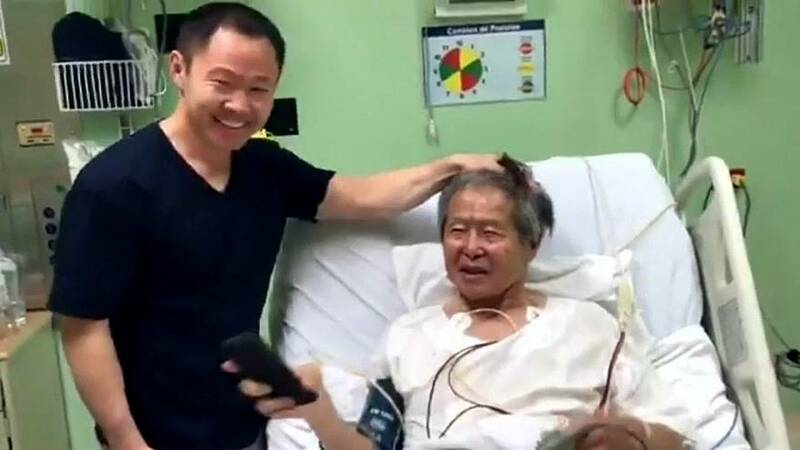 The disgraced former president of Peru, Alberto Fujimori, has along with his son Kenji, sent a Christmas message to the Peruvian people from the hospital where the 79-year-old is being treated for incurable and degenerative problems. That was the reason cited by President Pedro Pablo Kuczynski for granting Fujimori a pardon from his 25-year jail sentence for crimes including human rights abuses, corruption and the sanctioning of death squads during his decade in power at the end of the 20th century. Daughter Keiko tweeted ; "Today is a great day for my family and for Fujimorism. My father is finally free. This Christmas will be full of hope and joy!!" Keiko only just lost out to Kuczyinski in the 2016 presidential election, and there have been accusations the pardon was to buy enough votes to survive last week's impeachment vote in parliament. Ever since the Christmas Eve pardon people have been protesting against Fujimori, a divisive figure who is credited with beating the Maoist Shining Path guerillas, but at the cost of disapperances and extra-judicial killings.